Become a Bakehouse Tycoon by managing your business. Tap on your bakehouses and make strategic decissions. Expand your warehouses and upgrade your delivery staff. Sell different kinds of bread 🍞🥖 🥐 to be rich. Spend your money on new investments. Gather different boosters and loot packs to increase your business performance. In case of any problems with Bakehouse Tycoon, instead of giving us the negative opinion, please send us an e-mail and review briefly the problem. It will help us to solve it in the next updates of the game. 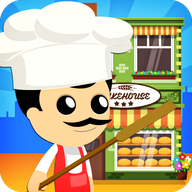 Bakehouse Tycoon – idle clicker game is free but contains ads. Revenue from advertising will help us to create new attractive games and applications. All permissions are required only for advertising and are supported by trusted vendors.